Veteran pilot Chesley ‘Sully’ Sullenberger became a hero in the flash of a New York minute in 2009 when he safely landed US Airways Flight 1549 in the Hudson River, saving 155 lives. Sullenberger, in his late fifties, always maintained that he was just doing his job, but the cool-headed actions of the former fighter pilot and his crew were hailed as an amazing act of confidence and bravery by the media. The outcome of the incident – which was potentially horrific after both engines became disabled following a mid-air collision with a flock of Canada geese – hinged solely on the pilot’s confidence in himself and his crew. 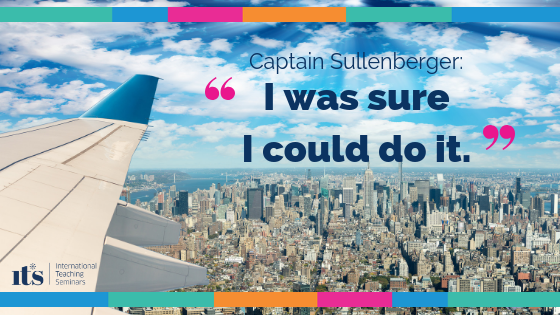 Instead of being overwhelmed, Captain Sullenberger had in his mind a series of specific tasks he needed to execute successfully. But that wasn’t all. In particular his father’s suicide and his inability to prevent it had a profound effect on how he viewed life. Life became extraordinarily fragile, fleeting and precious. Gradually, in the wake of this traumatic experience, he came to hope that through a series of small actions over the course of his life he would be able to know that his being here would have made a difference. This is the backstory to a major news event. In those critical moments on that particular morning above the Hudson the fact that he had not been able to save his father made him all the more anxious to save as many lives as possible. If you want to understand why he was so good at what he did, you need to take into account how Sullenberger’s beliefs and values meant he was totally motivated to deliver – in this case, life itself. He had taken something from a very tough time and made something of it that enhanced how he lived and motivated him to do things to the best of his ability. Confidence is often a mix of what you can do and what you believe. Having the skills is only part of the story. Certain values and beliefs will prove a powerful motivator for excellence. While these may produce positive results, they may have been born out of anything but positive life experiences. In a sense you could say those passengers owe their lives not to Sullenberger’s father committing suicide but to how he reacted to it. This is an extreme example of a really important principle: it’s often not so much what has happened to you but what you make of it that is going to be the deciding factor in whether an experience can strengthen or undermine your confidence. And this is true in every life, even when there’s nothing as dramatic as a landing on water. This post is an extract from the book Boost your Confidence with NLP by Ian McDermott. If you are interested in exploring confidence or NLP – either from a personal or professional perspective – then please do Contact Us.